Rockstar Games has announced a couple of new updates that will give players more reasons than ever to return to Grand Theft Auto V soon, including a brand new game mode, a highly anticipated new vehicle, as well as in-game sales on various guns and gear. According to the Rockstar blog, the online component of Grand Theft Auto V will soon be bolstered by a brand new game mode called Inch by Inch Adversary Mode and, based on the description, it looks like players can expect a super violent game of paintball meets soccer. Set to arrive this Tuesday April 12, the Inch by Inch game mode sees GTA players fighting over possession of a package that they then want to carry into their rivals' goal area. You'll need to dart between cover in order to dodge bullets and score a point and, once that's done, the field will reset and players will get to fight over a fresh package all over again. Similar to many games' capture the flag mode, the player carrying the package will not be able to use their weapons, so they'll actually need to rely on their teammates if they ever hope to reach the end zone. To even that out, though, the carrier will earn a slight boost to speed. 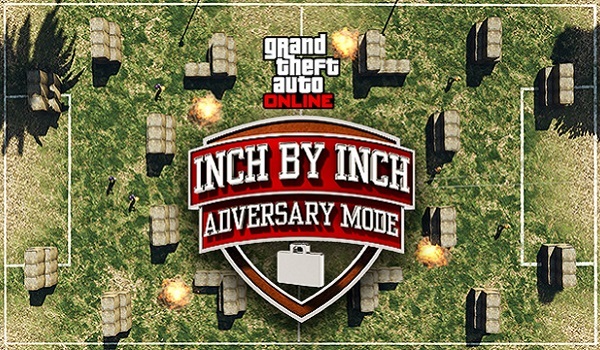 To complement the introduction of Inch by Inch, GTA will also host a special event called “Adversary Modes Week,” which runs from now through April 14. During that time, anyone who plays Adversary modes will earn double in-game cash and experience. As an added bonus for this promotion, players will enjoy up to half off on in-game sniper rifles, shotguns, body armer, and select attachments. Those sniper rifles will be 25 percent off, with shotgun attachments marked down by 30 percent, shotguns themselves marked down by 40 percent, and sniper rifle attachments and body armor marked down by a full 50 percent. If you need some new gear in GTA, now might be a good time to hit up the Ammu-Nation store. Even more exciting is the fact that Rockstar is finally bringing the Vapid Minivan Custom to the GTAV garage. While this sweet family-friendly ride isn't as “baller” as some vehicles in the game, you can now take the Vapid to Benny's Original Motor Works and get the thing tricked out with some fancy interiors, shiny exteriors and hubcaps aplenty. Similar to the Inch by Inch game mode, the Vapid Minivan will launch within GTAV starting April 12. As always, we're really excited to see Rockstar continue to support GTAV, especially this deep into the game's life cycle. It's little incentives like these that keep players coming back for more, which certainly seems to be the case as GTAV's community is as strong as ever.